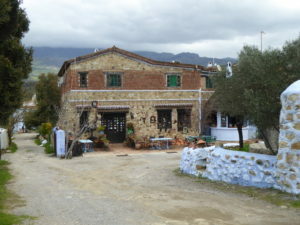 (last visited in 2009) before a long Final Rally lunch at a small but noisy cafe just outside the town. I found that I had lost my driving licence to the last Moroccan policeman to stop me leaving Ifrane so Allison drove and I was one of the few who could drink! A gentle run into Seville completed the rally and we expect the car to be home in about a week for work on the sump guard, new front springs/shocks and a full regrease/replace wheel bearings as the next rally has multiple river crossings. 7 April back to Europe. 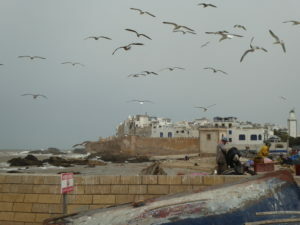 We caught the 10.00 ferry back to Tarifa and our farewell to Morocco was doused in rain. 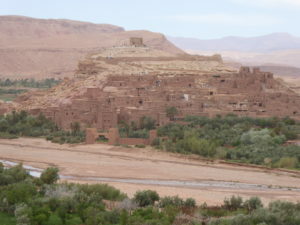 The rally had arranged a competition to find the Golden Tajine, a Tajine being traditional Moroccan cooking-ware effectively producing individual stews. 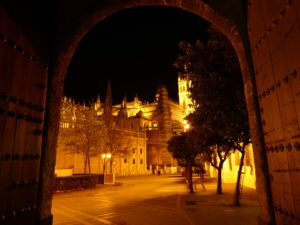 One crew had identified the location in Spain) about a week into the rally using the clues provided on the route. The rest of us were largely clueless but we combined with another crew on the ferry to pool our limited knowledge and with a lot of help from the organiser we identified the location just as the ferry docked. As luck would have it we were first off the boat and set off to the secret location. Very soon we were overtaken by a Mercedes on a Mission – having made the early identification, they didn’t want ANO stealing the prize! We reached the hiding place to find them there and plucked the wrapping paper from the hole. Our hotel was mega expensive but did have a well lit underground garage(once the lights were turned on). The brakes were squealing so the mechanics and I checked all pads – and found that one front spring was broken. Not altogether surprising given the terrain but may well have happened on a very bumpy tarmac road this afternoon. which the rally organiser assured us everyone could do. 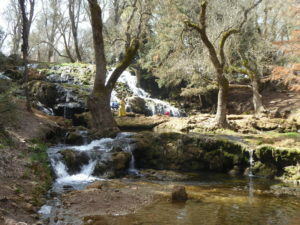 4 April we chose the main road option to Ifrane, a French constructed town of the 1920s,buolt for the French administrators to escape the heat of the summer into an alpine scenery. Now a ski resort – with all of one lift! 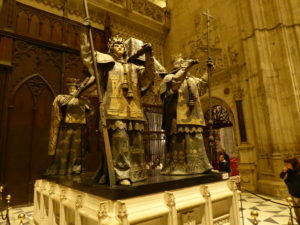 3 April – the curse of Midelt. Today we journeyed to Midelt, scene of major mechanical failures in our previous two visits would the third be more successful? Answer – no! 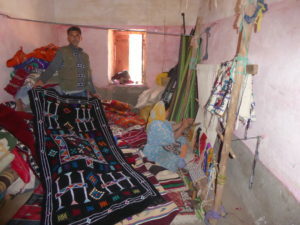 Lunch was at a café just past the Todhra Gorge where Allison succumbed to a carpet buying urge. It was after that that things went belly-up! 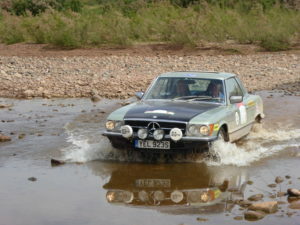 The water splashed the electrics so after chatting to other rally drivers we restarted on one cylinder. Whilst drying out we noticed fuel leaking from the Carb fuel joints so we solved that and carried on. Then the throttle return spring jumped out and the engine revved at 2500 which is very bad news in town. We were surrounded by most annoying kids whilst we found and relocated the spring. 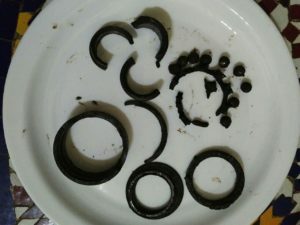 And lastly that gentle grumbling from the rear turned to a full bodied set of squeals – a rear wheel bearing had failed! We carry a hub extractor and spare bearings so the evening was spent with rally mechanics replacing said bearing and after a 12.00 bedtime we were good to go for tomorrow. We have no plans to revisit Midelt! 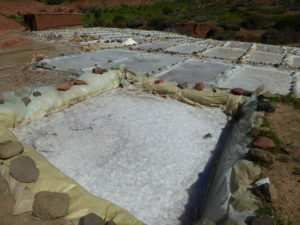 1 April was a rest day so we wandered first back the way we had driven in, looking at the local salt production. As we were on a hillside I did not see how mountain streams would produce salt. 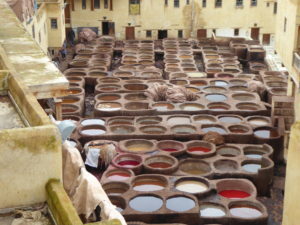 They pump water from wells into settling pans and collect the salt as it evaporates. The area is also rich in amethyst, which looks like a dirty overgrown egg but when broken on its fault line displays a bright pink, purple or white interior. It must be this rock formation which also generates the salt. After lunch we wandered the other way to a rickety pedestrian bridge over the river. 31 March to Ourika Valley. 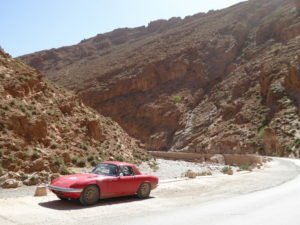 The first section was over the famous Tizi n Test pass, which we had travelled in the opposite direction in 2005. In parts the road has been rebuilt but some is still the old road. 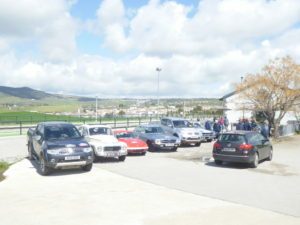 We zigzagged our way up, passing and being passed by other rally cars as we stopped for photo opportunities. At one coffee halt, one driver was hit by a car as he walked around some parked cars. Although knocked over, it seems he fortunately escaped with bruising and shock. 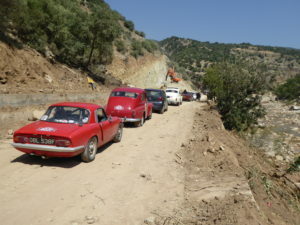 The last 3 kms to the mist expensive hotel in the area was along a narrow, rutted village dirt road and we grounded on several dips and lumps; the rally organiser driving directly behind us reckoned he heard each one! 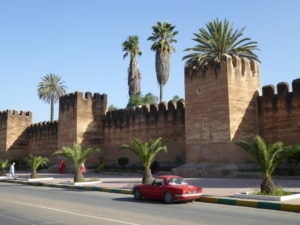 and a Kasbah (fort) where we hoped to find supper at the Kasbah Palace Hotel. Disappointment reigned as the hotel was more dead than alive but had all the signs of faded grandeur. 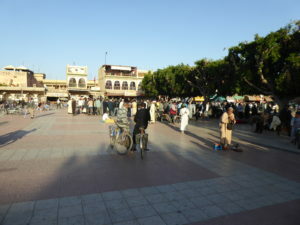 The town square was hosting a festival – but only men attended – women’s place is elsewhere in this culture. 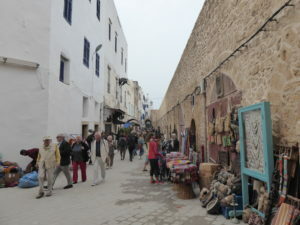 29 March rest day at Essaouira. 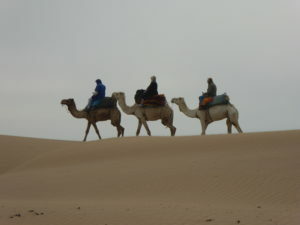 28 March to Essaouira. 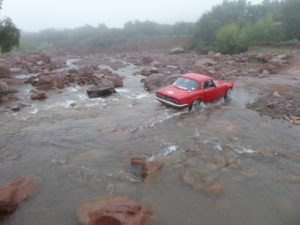 One section was described as very rough and best for us to avoid, so we took a shorter more gentle route before re-joining the main track in time for a river fording. We failed to get a photos of ourselves so this is one of the Mercedes. 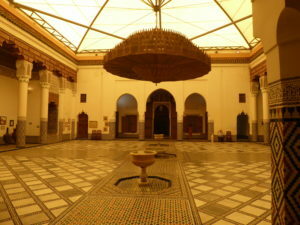 27 March rest day in Marrakech. Our hotel was well out of town and little known by local taxi drivers as we found out when trying to get back. We spent the day as tourists and rather naïve ones at that! 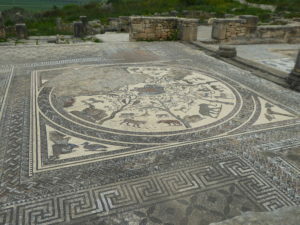 Our first stop was some gardens some way off the beaten track; we walked there but our return taxi tried the old trick of asking us to pay “what we felt was right” – should have asked first! He expressed great disgust at our miserly payment but it was probably too much anyway! Next up was the shoe cleaning scam. 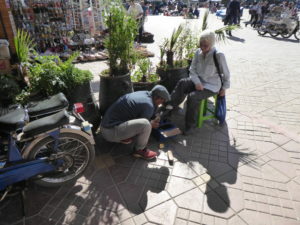 The shoe cleaner quoted “5” so, thinking it was 5 dirham I agreed, then he offered Allison’s shoes for free – then it transpired it was 5 Euros, not Dirham, a tenfold difference and he wanted payment for Allison’s “free” clean. We escaped that and got the “guide scam”. A man with child in pushchair offered to show us the way to a museum – and got lost despite asking every shopkeeper he passed! We got to the museum after a few backtracks – closed Tuesday – and today was Tuesday! Our guide then demanded payment – to feed child in pushchair of course, must have the emotional appeal. Again disgust at our miserly offering! 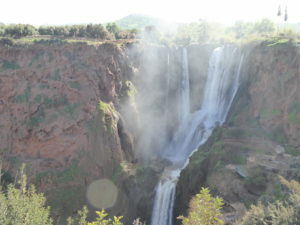 Our first destination was the Ouzoud Waterfall. We spent longer here than we should and were the last to leave – and promptly set off in the wrong direction. 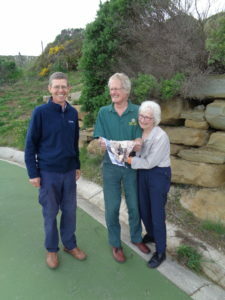 Navigation was primarily by waypoints pre-loaded onto an Ipad but Allison tried to ignore that and preferred the tried and tested tulips and road book. We also had the same waypoints loaded onto the TomTom but every now and then it disliked an offroad section and said no route was possible. The sweeps could see us on the tracker so waited till we caught up and could not work out how we had got behind them despite setting off in front. 25 March to El Oudine. We were the first away from the hotel but progress was soon halted by a police radar trap and I had to pay about £12.50 as a roadside fine. We climbed up into the clouds, fog and rain. 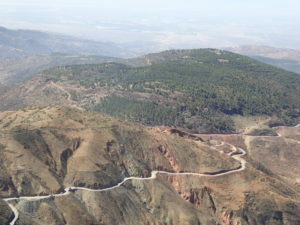 That cleared as we reached the Middle Atlas and the afternoon was warm and sunny. 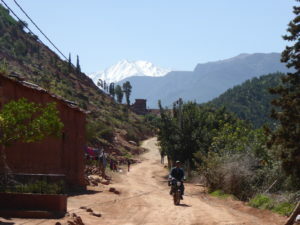 Our track left the main road and we climbed over mountain ranges; roadside lunch was at 1540m then we dropped down to a narrow road with broken tarmac but all easily navigable, ending at an isolated hotel near the El Ouidane reservoir. 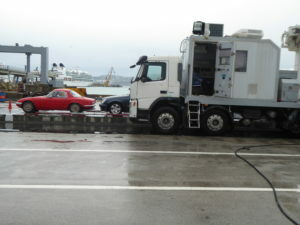 One of the Mercedes had a very close encounter with a local truck, damaging the offside door and rear wing and removing part of the rear bumper; no-one was hurt. The Lotus continues to run well. 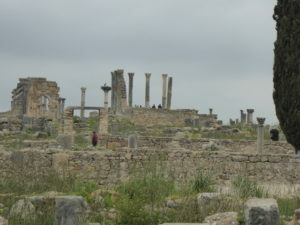 24 March to Fes – another day offering an easy alternative but our concern was more the state of the mud roads after all the rain. The organisers offered a second alternative, try the rough section and take a shortcut if the mud looks too bad. We set off with that in mind. Shortly after leaving we came across a stranded Volvo with a broken suspension mount – welding required! On the dirt road the car soon got covered in mud and I got more than I thought my fair share through the window. One section was deep mud where a lorry had gouged deep ruts. 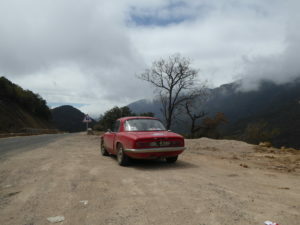 The Mustang again got stuck further ahead along with one of the Mercedes – our choice of the short cut was well founded! 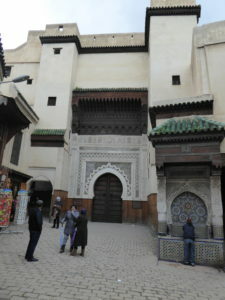 We reached the hotel in time to be tourists in Fes. 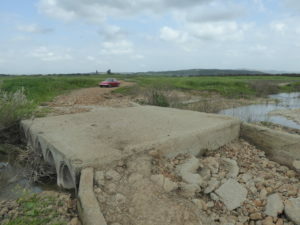 23 March – a short day as we took an alternative section to avoid the worst rough parts. Any time saved we lost in trying to visit Tetouan. 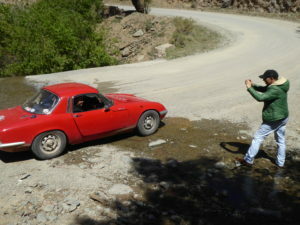 Tetouan is on a hill and Allison was struggling with the clutch, she could not reach the handbrake and the car was stalling! Altogether not a happy experience. Odd that the tickover, which had been happy on European fuel, now faded away with Moroccan. Fortunately solving the tickover and handbrake were easily resolved in the hotel car park. The hotel, an auberge outside town, was very romantic in the midday sunshine but we were glad later that we had chosen a room with a log fire. 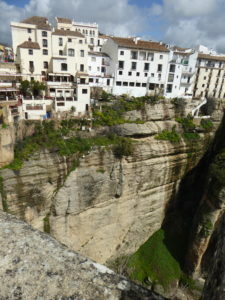 The afternoon was overcast with a cold wind and it rained all evening and all night – it was cold! 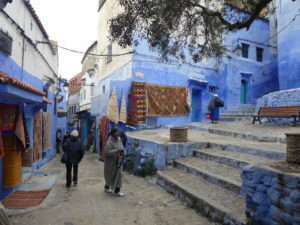 We spent the afternoon in the all-blue town of Chefchaouen, now a tourist destination but the traders did little business with the tourists more concerned with keeping warm than buying souvenirs. 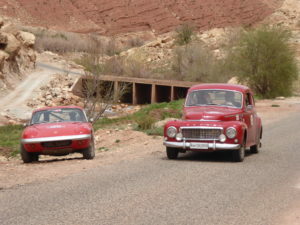 A rally into Morocco, starting and ending in Seville. 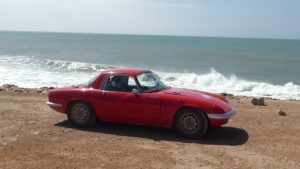 The Elan was transported to the start – so Allison could spend more time with the dogs. Prior to the rally, I had changed all the clutch hydraulic parts as I got bored with changing the slave cylinder in hotel car parks! Also changed was the brake master cylinder and our well used Brazilian tyres. After the steering’s jumpiness in USA I spoke with Spyder and fitted their adjustable upper front wishbones so the front wheels are now as close to vertical as possible. 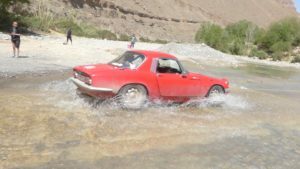 This entry was posted on March 22, 2018, 10:28 pm and is filed under Patagonia Rally 2010. You can follow any responses to this entry through RSS 2.0. Both comments and pings are currently closed.